Mr. 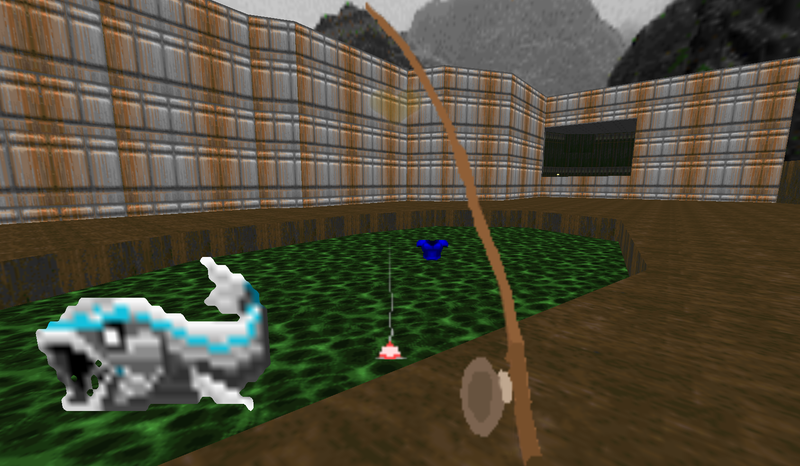 Friendly is a new mod for Doom that asks you to talk to the monsters instead of killing them, fish for fun, and steal textures from the walls. It’s light-hearted and interesting, and opens up the world of Doom in a complicated, fun-loving way. Since its original release in 1993, Doom has been lauded as a central pillar of the first-person shooter genre. In the wake of that game’s release, after all, we had the creation of the term “Doom clone” before we settled on the more general term of first-person shooter. It set new standards for gunplay, level design, and the level of violence you can put into a game. Shooting enemies creates great roars of noise and big splotches of viscera. It’s a gross and loud thing. If you’re thinking about games in that way, then it starts to make a lot of sense to respond to a game with its own rules. It also helps that modifying Doom is a more simple process than you might think, and LeBreton has been using an open-source fork of Doom called GZDoom to do his alterations. Billed as an “enhanced port of the Doom engine to modern operating systems,” GZDoom opens up an entire world of controls and abilities that were not available in the original game. Mr. Friendly has you talking to the creature of Doom to see what they’re into, and they’re mostly just wandering around either thinking about their lives or wondering where their precious items are. You can do quests to help them, or you can just ignore them in a bid to explore this world without the threat of violence. All of the original game’s items are here, and LeBreton has added a little bit of “lore” for the game’s enemies to know about their side of the conflict. Health pickups are an energy drink that their boss has abandoned. Exploding barrels are well-loved, cozy fires. The more serious objects in the environment give some context to the levity, though, and it is through this contrast that I really came to appreciate them. You can find Doom Guy lying dead on the floor, and your character’s internal monologue drives home that “sometimes we win.” There are also hidden journals around the maps that can only be found and read with an item called Golden Vision. These journals, written by the Wandering Demon, were explained to me by LeBreton as being the work of a being who is “reflecting on [the game] in a way that is a bit closer to my perspective as a player and someone who thinks critically about Doom and game worlds.” They’re fragmented and strange, but they drive home that this is a world with people in it, and that players might have access to a full story. Something bad is happening in the world at large but we’re trying to get by, holding on to each moment of goodness, trying to care for each other. Most games have a depressingly limited vocabulary for focusing on that, and Doom is no exception, but I figured the lack of seriousness would be disarming in a good way. Despite only being in Alpha currently, Mr. Friendly is already something special. Even though I don’t know much about Doom mods (or even how to install these things, I recommend this page for installing GZDoom), I found Mr. Friendly’s plainspoken, direct approach to questioning its forebears to be something worth checking out in contrast to our current grimdark universe. Because if these creatures being murdered by the Doom Guy can figure out a way to make it through, then there’s gotta be hope for the rest of us.